Hightstown, NJ — After being slowed for three months by a training accident earlier this year, Kevin McDermott is looking forward to rejuvenation this spring and summer. McDermott, who is stabled at Magical Acres in central New Jersey, is among the state’s horsemen buoyed by Gov. Phil Murphy’s recent approval of legislation directing a total of $100 million to horseracing and breeding during a five-year span. 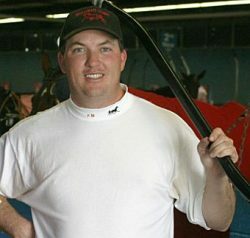 The 51-year-old McDermott has been part of the harness racing scene in New Jersey since he was a teenager. Since opening his own stable three decades ago, he has won 1,569 races and $24.5 million in purses. Notable horses trained by McDermott include stakes-winners Hypnotic Blue Chip, Lonewolf Currier, Mac Action, Major Look, and Yes Its True as well as millionaires Blueridge Western and Noble Falcon. Since opening his own stable three decades ago, Kevin McDermott has won 1,569 races and $24.5 million in purses. USTA photo. McDermott has eight horses at Magical Acres, including Melanie’s Tedy, who was a winner in divisions of the Indiana Sire Stakes and Kindergarten Classic Series. He was sired by Hypnotic Blue Chip. 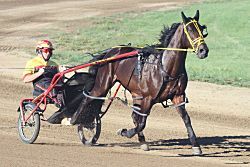 In 2012, McDermott and his brother John, who also is a trainer, were honored by the New Jersey chapter of the U.S. Harness Writers Association with its Stanley Dancer Award. The award recognizes individuals whose efforts on behalf of racing and cooperation with the media are in keeping with the example set by the late Hall of Fame driver and trainer Stanley Dancer. 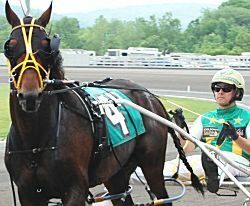 McDermott recently took time to speak with the U.S. Trotting Association’s Ken Weingartner about his past, present, and future in harness racing. KW: Let’s start at the beginning. How did you get started in harness racing? KM: I was pen pals with Jim Doherty, Herve Filion, a bunch of guys in the sport, and got my first job working with Jack Parker Jr. I was 16 years old. I had crawled under the back gate at the Meadowlands. I’ve been doing it ever since. KW: Do you think younger people know what a pen pal is? KM: (Laughs). That’s true. I used to go to races with my dad and I got to like it so I started writing letters and people would answer me back. That’s how I got into it. I started collecting whips too. KW: Were you surprised people were so responsive? KM: Carol Hodes, who worked at the Meadowlands (as director of media relations) at the time, helped me out a lot. Whenever I would write to her as a kid she would always get them to respond to me, and it was them responding. So I owe Carol a lot. KW: What were your hopes when you started out writing to these people? KM: In high school I was an all-state track runner and I had scholarships to go to a lot of schools, but all I wanted to do was work with horses. I had no family members in the business, but I always loved the horses. It’s all I ever wanted to do. KW: What did you run in high school? KM: I was a half-miler. Pure natural talent was all I had. It wasn’t work ethic. (Laughs). KW: So what was it like when you first started with the horses? Kevin McDermott with Lonewolf Currier, who banked $271,448 as a 3-year-old in 2013. USTA/Mark Hall photo. KM: The first summer I worked with Jimmy Doherty, just helping out. Then Jack Parker Jr. kind of took me under his wing and really treated me good. I always joke with Jack that if I ever hit the Mega Millions he’s the first person I’m taking care of. He’s a great person. KW: Did you go off on your own after that? KM: I worked for Linda Toscano and Nick Sodano for a couple years each and they were both great. Then went on my own and claimed a $7,000 claimer named It Will Be Me at Freehold and she won her first three or four starts. I kind of got lucky that I was doing good. D’Elegance Stables gave me the opportunity to train one or two horses and it just led to another one and another one. Before you knew it, I had 30 horses. KW: What do you enjoy most about your job? KM: I just love the horses. I love working around the horses. There’s just something about it. You develop such a bond with them. They’re just great animals. KW: How many horses do you have right now? KM: I only have eight. It’s the fewest I’ve had in 30 years. Earlier this year I got into an accident; I broke five ribs, got knocked unconscious, bruised my spine, bruised my kidneys. I was down basically for three months. I kept working through it, but I’m just starting to get healthy now and I’m going to try to expand my stable again. KW: Of the ones you have now, who are a few that you like? KM: Melanie’s Tedy. 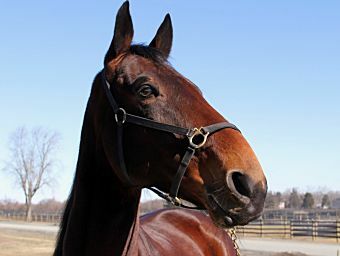 He’s in the Reynolds and the Rooney at Yonkers and then he’ll go on to the Indiana Sire Stakes. He raced his first start (Sunday against older horses at Harrah’s Philadelphia) and came the back half in :55. I was very happy with him. I think he will be in for a good year. His sister Melanies Angelique has been training down very good too. I also have a (2-year-old half-sister) to Lonewolf Currier and Lookout Hanover named Last One Hanover and she’s been going very good too. KW: What have been your biggest thrills? Hypnotic Blue Chip was a world champion for Kevin McDermott. USTA/Ken Weingartner photo. KM: Probably winning the Titan Cup with Mac Action because he was an Amish horse that went on to become a great trotter. We kept him until he died at 21 years old. No question Hypnotic Blue Chip winning the U.S. Pacing Championship in a world-record (1:47.2). More importantly, I did it for (owner) Fran Azur, who has been like a father figure to me. Fran only breeds his Hypnotics right now, he hasn’t been buying racehorses and it’s hurt my business, but he’s the best. I absolutely love him. KW: What races haven’t you won that you would most like to win? KM: I’ve never won the Meadowlands Pace or the Hambletonian, but besides that I’ve won my share of big races and I’ve had four or five world champions along the way. I’ve got almost 1,600 wins and I’m very proud of that. KW: What is most rewarding about working with the horses and is there a horse in particular that stands out as having been really rewarding? Noble Falcon banked $1.15 million in his career. USTA/Ken Weingartner photo. KM: I think Noble Falcon. We bought him at Harrisburg for ($80,000) and we were really just looking at making him a 4-year-old $50,000 claimer. He made a million dollars and he did it the hard way. He did it in overnights, he never won a big race. He was just a treat to be around. He’s a beautiful horse. He’s got a home for life, him and Blueridge Western, who both made a million dollars for me. Fran gave them both homes for life, which to me is very special. KW: What has been the most valuable lesson you’ve learned over the years? KM: Just to be fair to the owners and tell them the truth, whether it’s good news or bad news. I’ve been blessed to have very loyal owners for years. KW: With New Jersey getting the appropriation for the next five years, how big of a boost has that been and how big of a boost do you see it being for everyone here? KM: It saved the sport. I think it is tremendous. I train horses for (Meadowlands CEO) Jeff Gural and I’m thrilled for Jeff. I just wish I had a couple more horses that I could race at the Meadowlands. Hopefully over the next month or two I’ll pick up some stakes horses and be able to race more at the Meadowlands. I think New Jersey has to get better horses to race here. I think the higher-class horses have to come back to the Meadowlands to make it like it was. There are not too many trainers who were around in the ’80s, ’90s, 2000s when it was the mecca. I was there and I would love to see that come back. At the end of the day it comes to be bringing bigger horses back, the higher claimers and higher-class horses, and we need to try to get some of the top drivers back too. KW: What do you like to do with your free time? KM: I really don’t have any hobbies anymore. I love watching my son (Liam) wrestle. He’s a good wrestler in college (at Roger Williams University in Rhode Island). I live for my kids, and that’s the truth. Everything I do is for my kids now. That’s it.